So what was the story in 2009? How did it unfold? Now we bring you the account of the Tenth day of this sublime divine odyssey. Day Ten of Kodai 2009 happened to be the 2nd of May. With departure around the corner and all the regular events like boating, horse riding, Narayana Seva included having been completed, the morning session that day was quite normal, in the sense, Swami came out at the usual time, that is to say around 10 o’clock or so, and gave darshan. Even as the boys sang bhajans the sun was shining brightly and the big crowd was having its fill of the glorious and radiant form of Swami, as He slowly went past the devotees in His chair. 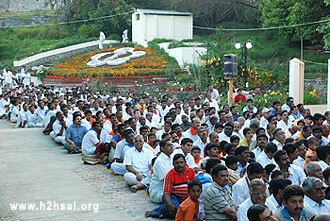 In the evening too, Swami came out as usual to the Bhajan Hall, and the boys started bhajans as it happened everyday. The bhajans were going on as usual, in the Bhajan Hall of course, with Swami seated there. 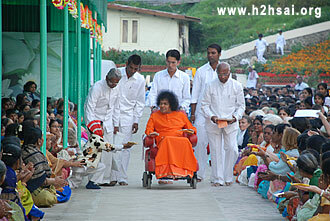 After a while, Swami signaled to me and I went near Him. He said: “Go to the verandah and get ready to speak. I shall follow you.” I was a little taken aback; not because He asked me to speak but because Swami said He would be coming to the verandah. The fact is it was evening and getting dark, and there was a chill wind blowing from the lake. As I moved towards the verandah to get ready for my talk, I was struck by what Swami said, because it was one more example of His desire to please devotees and give them joy, by giving them darshan even though it meant a lot of personal inconvenience. I am not sure whether the people outside ever realized that! I suppose they wouldn’t have carried away, as they were, by the joy of seeing Swami. But we must take some time off to reflect on how much Swami gives of Himself for our sake! And maybe that would motivate us to take His teachings seriously and make us follow them to at least some extent. So, that is what happened. 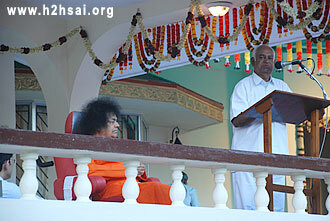 Swami asked the Professor to go the balcony and address the big audience that had gathered as usual in the darshan area. These are the people who could not be accommodated inside the Bhajan Hall, where space was rather limited. In fact, every evening there was a fair size of crowd outside, even though often a chill wind blew and there was even some rain on occasions. Incidentally, such is Bhagavan’s compassion, that almost every day, Swami would go out for a brief period outside during the evening bhajan, to give those people out there the joy of darshan; and how happy they used to feel! After the speech there was arathi, which brought the curtain down on day 10. Thank you for being with us, and in the next article we will bring you the story of the penultimate day of this divine Kodai odyssey. Jai Sai Ram.